Another rare species, Camellia forrestii is grown more for the fine glossy foliage, emerging a nice deep red before and turning to green with age. This is an excellent plant for a shaded border, a very different habit to the hybrids we see offered widely. A more open growth habit and attractive if small flowers make this an interesting addition to small to medium sized gardens. 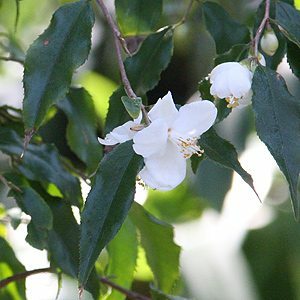 Small pretty white pink tinged fragrant flowers, and Camellia forrestii has a ‘weeping’ habit. A small growing species to around 3m. Tolerant of cold and frosts and a shade lover. Use as an understory plant beneath larger deciduous trees, near the drip line. Camellia forrestii is another small growing species from the mountainous regions of China’s Yunnan province. It has an attractive weeping habit and deserves more attention from landscapers. Camellia forestii – Summary Information. Spread – Forms a bush of around 1 metre across. Position – Dappled shade with some morning sun. Soil – Humus rich, well drained with some moisture. Foliage – New foliage emerges red to bronze, turning to deep to mis green. Flowers – Bell shaped, white in colour often with a pink blush.